Life insurance premiums on multi-premium policies that provide policyholders an option of lapsing without recourse can be reduced if insurers fail to give lapsing policyholders 100% of the "reserve" for that policy —the excess of the expected present value of future death benefits over the expected present value of future premiums. A failure to provide the full reserve value means that, absent transaction costs, owners of life insurance who know to a certainty that they will not let the policy lapse can actually make a potentially large expected profit. They – rather than their estate – can realize a portion of this expected profit by trading ownership of the policy for cash to investors who diversify much of the risk away through similar transactions and whose greater liquidity may reduce the risk of lapse. This variant of a "life settlement" is known as "Spin Life." This Demonstration illustrates conceptually the relationship among premiums, mortality rates, and anticipated interest rates in long-term life insurance. It further shows the profits theoretically available through "Spin Life." The Demonstration allows users to set expected lifespans among lapsing and non-lapsing policyholders, as well as overhead charges on the purchase of insurance. The Demonstration is based on a two-step model in which some policyholders die during the first period and the remaining policyholders either lapse or live for some time thereafter. The expected life span varies depending on whether the policyholder lapses or not: in the real world, lapsing policyholders tend to have longer expected life spans than non-lapsing policyholders. Mathematica computes the premium needed to break even based on the user's choices as to the lapse rate, the fraction of the reserve paid to lapsing policyholders, the percentage of policyholders dying during the first period, the expected life span of lapsers and non-lapsers, the interest (discount) rate, and the overhead of running the insurance system as a percentage of premium. 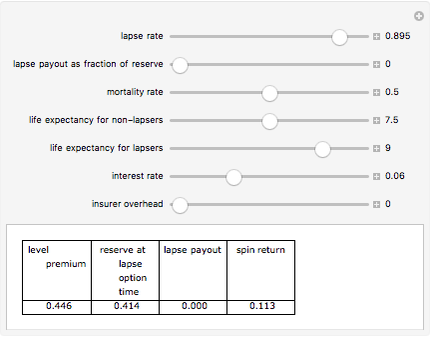 The Demonstration calculates the level premium needed for the insurer to break even, the size of the reserve at the time living policyholders have the option to lapse, the payout upon lapse, and the return a spin investor could expect to see, i.e., someone purchasing a policy during the first period knowing for sure that, so long as the insured survived, they would not lapse. When there is no life expectancy differential among lapsers and non-lapsers, spin life fails to make money. Lower payments on lapses coupled with lower overhead can result in low premiums and make spin life very profitable. Seth J. Chandler "A Conceptual Model of Lapse Financed Life Insurance"